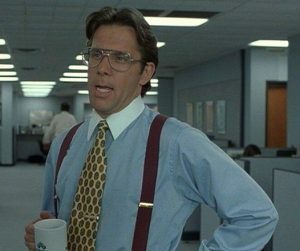 I have always thought of fictional Bill Lumbergh as a middle management puppet. 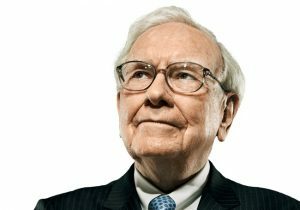 As I reexamine I see him more as a Warren Buffett disciple. Lumbergh was smart enough to bring in a pair of consultants to analyze his company, Initech. As part of his introduction of the consultants(the Bobs) to his employees a banner is hung and the buzz phrase is established. With every decision you make is this good for the company? I don’t think this cinematic excellence pushed me down that path but, now I am one of the Bobs. My business partner and I have a strong distaste for Michael Bolton music. The institutional imperative can take many forms. Publicly traded companies who overly focus on the current stock price, often pressuring Wall Street analysts about their investment rating, are all part of the institutional imperative. Focusing on the stock price or caring about Wall Street’s investment rating is counterproductive. This behavior creates a major distraction for company management from focusing on what is important— running the business. We see it with financial services companies and insurance agencies. Their top priority is getting new clients. It is #2 as well. Is that new client going to be as profitable as an existing client? Have you maximized your existing portfolio? Have you as the owner improved your expertise and given the same mandate for your employees? The focus is on the wrong thing. It starts at the top. This seems to be particularly true if the institution in question is a bank. Take, for instance, the industry’s love affair with auto leasing back in the 1990s. For a while, the business generated solid returns. Then, as is to be expected, competition intensified and returns fell to unacceptably low levels. Did most banks curtail originations or exit the business when profits began to dry up? Nope. Most hung on doggedly until profits turned into losses that eventually proved ruinous. Board members should insist on being regularly briefed on the profitability levels of various product lines and market segments, and should encourage management to make any needed changes before profit levels become unacceptable. 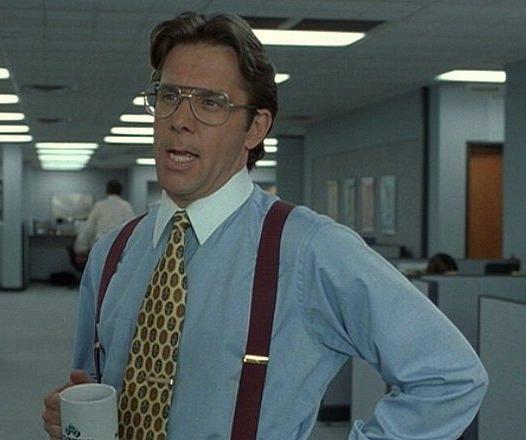 Maybe this is a stretch but, I never would have pegged Bill Lumbergh as a forward thinker. He clearly had to intuition to bring in a consultant group to better assess his company. Was he too close to situation to truly gage company efficiency? Perhaps. Was he a Warren Buffett protege implementing Berkshire Hathaway’s approach to business? Signs point to yes.